Easy is an extending console table that transforms into a dining table for up to 8 people, with built-in extensions hidden underneath the top. Measures 90 x 52 cm up to 148 or 200 cm. 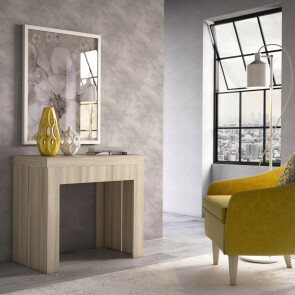 Galileo extending console table can reach cm 84 or 162 according to your needs. It can be completed by extra equipment and it is ideal inside environments of small measurements or one-room apartment. Single murphy bed table combo with wheels. Only 40 cm deep when closed, once opened can be used as a table for two or a single bed 215 cm long. The perfect spacesaver for small studio apartments. Living folding console table is available in 5 finishes of melamine coated wood and it represents the perfect space-saving solution for houses of small measurements or one-room apartments. 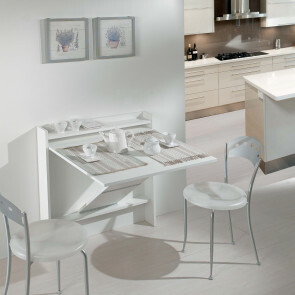 Diesis is a console table which can be converted into a dining table; it is available in three lengths. When opened it has a depth of cm 80. Realized in 5 finishes of coated wood. Galileo space-saving fold away desk is ideal inside the the bedroom or kids bedroom as an useful working space. Encumbrance of cm 18, it can reach cm 84. 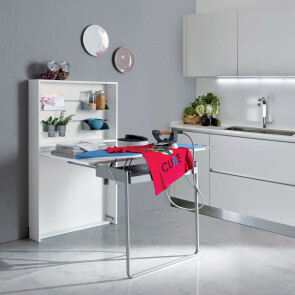 Galileo console table with fold away ironing board is available in two measurements and several finishes. When closed the console table has an encumbrance of few centimeters. Link Bed is a foldaway single bed integrated into a cabinet with casters. It can be matched to bookcases or used in corners of the house seldom used. Slatted base and mattress included.